CUCUTA, Colombia — This border city, already grappling with a mounting migration crisis, is bracing for a tense showdown that will likely mark a new chapter in the unfolding crisis of its neighbor, Venezuela. U.S. military planes continue a buildup of humanitarian aid on the Venezuelan border, a development spotlighted Sunday in an appearance by Sen. Marco Rubio, R-Fla.
More than 100,000 people are expected at a foreign-organized concert here on Friday to protest the Venezuelan government. And on Saturday, Venezuelan opposition figures with U.S. backing plan to lead thousands of protesters, dressed in white, to the border to confront the country's national guard. All of this has made Cucuta, a city of 750,000 people overwhelmed by the massive Venezuelan migration that has flowed over its border for years, very nervous. Venezuelan President Nicolas Maduro has vowed to block the aid, calling it a pretext for U.S. intervention in his crisis-stricken country. Venezuela is in the midst of a dire humanitarian crisis, and the relatively small amount of aid is meant to begin to relieve a severe shortage of basic goods that has fueled malnutrition and disease. But opposition leaders and U.S. officials also hope to elicit the first public mass defection of Venezuelan troops if the soldiers disavow their orders and accept the shipment. During a visit to Cucuta on Sunday, Rubio encouraged members of the Venezuelan armed forces to defect, calling the Maduro government "a criminal regime willing to starve and kill its own people." "There comes a time in many people's lives when they have to make a decision that will define them forever," Rubio said. "That time has come for the Venezuelan soldiers." Other American officials have also been clear that they want Maduro out of power and that they see pushing aid into the country as one step toward achieving that outcome. Some major aid organizations have refused to participate, objecting to the use of humanitarian aid for political ends. 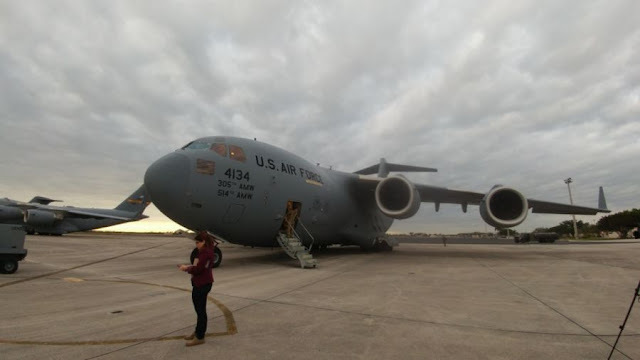 "Maduro has got to go," said Mark Green, the administrator of the United States Agency for International Development, at a news conference Saturday in Cucuta while 80 tons of food and hygiene products were unloaded from a C-17 cargo plane behind him. Officials say Cucuta will be the entry point of an operation that will breach Venezuela's border with humanitarian aid from all sides, with other staging spots in Brazil and the island of Curacao. But planners have not said just how they will do that. On Sunday, Venezuelan opposition officials handed out fliers on the Simon Bolivar International Bridge, where thousands of desperate Venezuelans cross each day to buy food or to migrate across South America. Opposition leaders called on Venezuelans there to join the effort to move the aid over their border but couldn't say exactly where or when. "We still haven't decided which border crossing to use," said Alcides Monsalve, mayor of the Venezuelan city of Merida, who traveled to Cucuta to help the effort. "We don't have any idea." In a speech to volunteers in Caracas this weekend, Juan Guaido — head of the opposition-controlled National Assembly who has evoked the constitution and declared himself the nation's president because Maduro is a "usurper" — said more than 600,000 Venezuelans had already agreed to join the massive effort Saturday. He said volunteers would receive further directives via email Monday. "There will be mobilizations in all cities around the country on Feb. 23," Guaido told a cheering crowd Saturday. "Not just caravans going to the border. It will be a whole country in the street." Leaders in Cucuta insist that the Venezuelan soldiers guarding the border crossings will accept the food aid, motivated by the hunger of their own families. But Venezuelans living on the Colombian side of the border expressed doubt. "They won't let it pass," said Victor Mora, a Venezuelan sitting near the border with the eight members of his salsa band, who all nodded in agreement. "The military structure has them really indoctrinated. They are scared to disobey." But many said they would join the effort to confront the border guards. "If Venezuelans can walk 20 days to Peru, then of course we can walk across the bridge to accompany the aid," said Julio Campos, 45, who has lived in Cucuta for a month. Four years ago, he said, he was member of his town council in the Venezuela coastal city of Puerto La Cruz, with a family, an apartment, a 2010 Chevrolet Optra and his own business in wholesale cheese distribution. He then watched the economy tank as food became scarce and his business folded. Now, like thousands of others, he pays about $1 per night to sleep on the floor of a large room with dozens of other Venezuelans in Cucuta, where he makes a small commission bringing bus passengers to travel agencies. He aims to send money home to his wife and three kids, but since arriving in early January, he has only been able to do so once. He didn't think the guard would let the aid pass, but he pledged to join the effort anyway. "For us Venezuelans living in Colombia, it's better to die without fear than to live crying," he said. Wilfredo Canizares, an activist in Cucuta and director of Fundacion Progresar, which tracks organized crime in the border zone, said local leaders have felt powerless as the big week looms. "It's all being driven by the national government and the U.S.," he said. He also raised alarm about next week's concert, announced Thursday by British billionaire and airline magnate Richard Branson, set on a highway a little over a mile from the Venezuelan border. Its aim is to raise $100 million for the humanitarian crisis there. A spokesman for the Cucuta police on Sunday said local authorities hadn't met with concert organizers. "It seems supremely inconvenient to organize a concert at this moment," Canizares said. "We are very worried by everything." In Venezuela late Sunday, five members of the European Parliament invited by the opposition to meet with Guaido in Caracas were barred from entering the country at Simon Bolivar International Airport, according to the opposition and members of the delegation. They were subsequently deported by Venezuelan authorities. "Attention, our passports have been taken and we're being thrown out of Venezuela," tweeted Spain's Esteban Gonzalez Pons. "We're being mistreated and the only explanation we're given is that Maduro doesn't want us here."